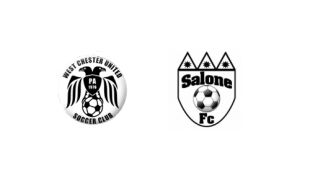 In the Championship Match of the Pennsylvania Open Cup, to be contested this Sunday, December 11, 2011, 2:00pm, West Chester United will host Salone FC. The Cup winner will represent Eastern Pennsylvania in regional play this spring for a berth in the Lamar Hunt US Open Cup. The match will be contested on the turf field next to the Chester County Government Services Center, 601 Westtown Road, West Chester PA. This is right off of the Westtown Road exit of Route 202. Both teams knocked off formidable opponents on their way to the Final. West Chester defeated last year’s champion, Phoenix Sport Club, 3–2 in overtime, while Salone toppled United German Hungarians Majors by the same 3–2 score. Is this the adult league in which VE has won several national titles? VE has teams in several area leagues. Their top teams play in the United Soccer League. The Cup competitions are not leagues, but rather national knock-out tournaments open to teams affiliated with US Adult Soccer. Currently, there is the Open Cup (open to all teams), the Amateur Cup (open to amateur teams), the mens Over-30 Cup, and the Womens Cup. Several years ago, there were also womens open, amateur & o-30 cups, but they were consolidated. There is a blind draw to set up the Cup brackets, then it’s a knockout competition to determine a state champion in each. In the Spring, the winners advance to regional competition against the winners of other states in the Northeast. In the Summer, the 4 regional winners play in a weekend final for each cup (all are at one location) to determine a National Champion. Each Regional Open Cup winner & runner up also get an invite to the Lamar Hunt Open Cup.